Wireless MAC, originally uploaded by Dexte-r. If you are using E71 (or other E and N Series’ devices) you may encounter issue with identifying MACs (hardware addresses) for built-in WLAN and Bluetooth modules. Don’t worry! It’s very simple. If you want to connect your phone with your wireless router and it uses MAC filtering try these codes following with green button. I need balkans product code for Nokia E71. Please if your have this, send me on my mail. Thanks so much. Widzę, że masz E71 z polskim menu. Czy mógłbyś podać jej Product Code? Ja zamówiłem już E71, ale w UK i zapewne będzie bez polskiego menu i znaków na klawiaturze, więc czeka mnie reflash. Having severe troubles connecting the E71 with WPA2/PSK secured hidden networks. Wont connect at all to Airport, will load just 1 webpage on the Netgear? Any infomation form soe one of you? I assume you are trying to connect to your home based wireless network. It would be good if you get the following details about your N/W before you proceed. These are typically available in routers admin login. N/W SSID Name, What kind of security it implements and any keys you would need to authenticate or encrypt/decrypt. 3. Provide a connection name. 10. Home Page = (you can leave it blank). 12. If its static then click Option > change and enter the IP address. 13 Otherwise if its dynamic (DHCP based) then this setting should be set at “Automatic”. 14. DNS Server = Typically its Automatic. 1. Once you are inside “Menu > Tools > Settings > Connection > Access Points” click ” options > help”. 2. I set it up myself within 45 seconds. I tried to setup my office wlan on e71. our wlan is wpa-psk and key is 64 characters. surprisingly i can only enter 63 keys – mobile stops taking input after 63rd key is entered. can I change settings else where to get it to accept 64 characters? My new Nokia E71 with Symbian OS is working fine for Internet Navigation with 3G, Open WIFI connection and at my home WIFI Network configured with WEP encryption. But I do have problems by trying to connect to the Corporate WIFI LAN Network, My company uses WPA/WPA2, TKIP with EAP “Protected EAP (PEAP)” which uses a Internal Authority Certificate “Secured password (EAP-MSCHAP v2” by loading an in-house file *.cer that MS Office as well as Smartphones with Office Mobile can load/install the file and within the Autorithies Certifies the Encription mode is presented to be selected. Into my Nokia E71 Symbian there are many Authorities Certificates (Baltimore, Entrust.net, Equifax Secure Global, Global Sign, GTE Cyber, Valicert, Starfield, GoDaddy, VeriSign, Thawte Server, Nokia Root, MIDP2, 260 Online, SymbianA,B,C) but CAN NOT FIND A WAY to install an additional certificate… In Office Mobile appears “COMPANYNAME” you select that and as far as you are an Network User and Passwork user you can connect to Intranet Applications as well as navigate into the Corparate Network. As far as I select all the WIFILAN options WPA/WPA2, with EAP “Protected EAP (PEAP) –> (EAP-MSCHAP v2) its prompts a Certification Error because the missing *.cer file. Does anybody knows how to add an extra Authority Certificate into the Symbian Nokia E71 phone to get WiFi LAN Corporative connection? Have the same problem with Cisco wireless I have at work and installing a certificate. Han anyone found an answer for a Nokia E71 ? WLAN CONNECTION ALREADY ACTIVE. CLOSE IT AND TRY AGAIN. Can anybody please help me sort out this problem. Dear Rashmi, i also got problem like your, so could you tell me how you solve the problem, please email me at cbe62782yaho.com. Your help is much appreciated. Thank You. Have the same problem with Cisco wireless I have at work and installing a certificate. Han anyone found an answer for a Nokia E71 ??? i am trying to connect ma e71 with my house wifi system..
but this same key i am using already for my laptop aswel..
plz if sumone knwo about any thing how to connect wifi..
plz help me out..thnx in advance for da person.. The above worked for me too. Make the letters upper case and remove spaces and connection no problem. can somebody help me …i can recieve email ..but when i try to send it ( both using wi fi ) its says “WLAN CONNECTION ALREADY ACTIVE. CLOSE IT AND TRY AGAI” this is only while sendin it ay the same time while recieving it downloads seemlessly ??? How can I change my WLAN MAC address ? There has to be a way to rewrite the OS NETWORK STACK so when needed to use a different MAC address not the one that’s been burned on the device. 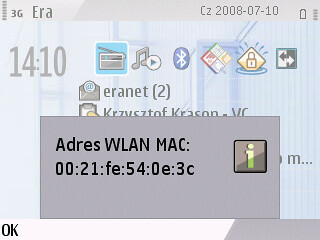 i have the same proble with fnagi, I tried to setup my office wlan on e71. our wlan is wpa-psk and key is 64 characters. surprisingly i can only enter 63 keys – mobile stops taking input after 63rd key is entered. I want to use e71 as wlan adapter for my pc…i got wlan connection in my e71 that I want to connect to my pc through a bluetooth.i made connection between pc and e71.bt nt able to use through wlan.can only use net by the service provider.is it possible to use e71 as a wlan adapter. There is a way to configure a PROXY into the E71 defauly Browser or any other Web Browser (I’ve already installed teh Firefox and doesn’t prompt it)?? Just a quick reply to the person who was trying to add a certificate to use with the EAP plugins. I giot a certificate file from my administrator at work ( a .der) file) I connected my E71 via USB and transferred the file to my phone. It ended up on the memory card in the others directory. I moved it over to the ‘other’ directory on the phone. I then used the phones file manager to locate the file, clicked on it and it installed itself. I weas then able to see it in the long list of certificates. Sadly I still can’t connect to my LAN at work but I think I am quite a lot closer to the solution. If you can share you network connection from PC via WLAN, the phone should be access the Internet, also remote syncing, for example with ovi.com etc. I haven’t heard about using WLAN for PC Suite. Anytime ki want to connect to a woreless network, my Nokia E71 keeps displaying system error. What should i do? i have laptop hp6000 with bluetooth and also it is connected to internet through lan cable, i am trying to get access of that internet on mobile which is e71 through bluetooth network, please guide with the procedure. I just ran into problems trying to connect to my home wireless. I could connect easily before it never asked me for a pre-shared key or password. and now nothing cant access at all. i am having a laptop hp with bluetooth and also it is connected to internet through wifi, i am trying to get access of that internet on mobile which is e71 through wifi network, but when i am connect it shows a error that ” general feature not supported” please guide with the procedure. Hello All. I’m having this problem with my E71. I’ve connected my device with the existing WLAN at my home. But I’m not able to access the network shared folders. Files and folders being shared out of different PCs but authorized to access. Could somebody please help me out? Thanks in advance. any one knows how 2 use e71 as wi fi adaptor for desktop pc? plz replay ..